If you’re working on building or rebuilding your credit, it’s essential to monitor it year-round. Here are a few of our favorite credit management services to help track your progress. The best part? They’re free. Kick off the new year without the holiday debt hangover. Here’s your survival guide to staying out of year-end holiday debt. Master the Basics and Hack Your Way to a Higher Credit Score! Credit Score Hacks shows you how. In Credit Score Hacks, learn the fundamentals of credit reporting and scoring, and the strategies that can boost your credit score, fast. Don’t wait to pick up this book. Learn the hacks to better credit today! or how credit information is used. In 2014, The Credit Cleanup Book (Praeger) was the first no-nonsense guide on consumer credit since the credit crisis. It taught you about credit reporting and scoring in today's credit climate. The Credit Cleanup Book provides you with credit and debt management tips and state-of-the-art tools that can be used to foster better money and credit management habits. With this book in hand, you will be able to achieve a higher credit score—your greatest financial asset. 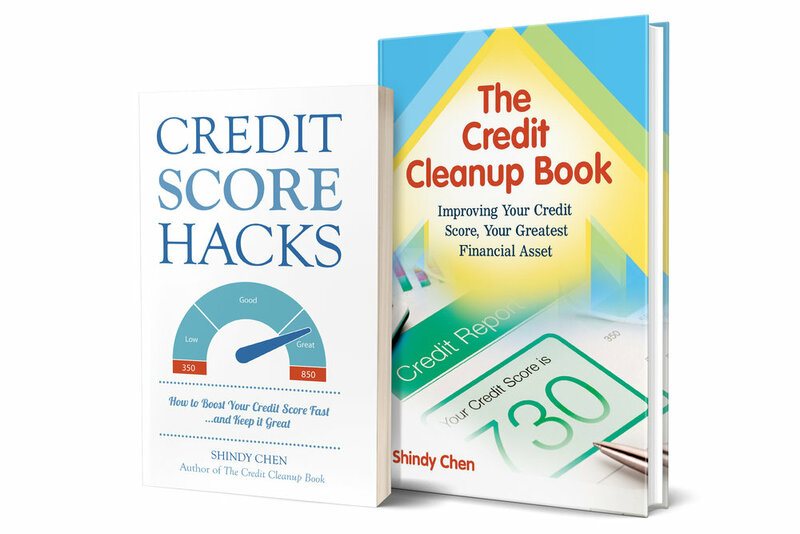 Praise for "The Credit Cleanup Book"
Shindy does a great job of explaining the ins-and-outs of what can sometimes be an overwhelming topic: consumer credit. She clearly describes how the credit industry is changing and evolving before our eyes, outlines what you need to know to deal with your own credit, and gives you the tools to do so. Great entrepreneurship begins at home. “The Credit Cleanup Book” is hands-down the most engaging & informative guide for improving your personal credit. Get our popular newsletter. It's quarterly, and every issue includes credit news and helpful tips to save you money. FREE BONUS: Sign up today, and receive Chapter 1 of "The Credit Cleanup Book," free in your inbox! Shindy Chen was a loan originator for Fortune 250 company Centex Homes, and later as a Vice President and regional manager for the nation’s 4th largest bank, Wachovia Mortgage, now Wells Fargo. Over her 7-year career she worked with hundreds of clients and their credit reports, grossing over $100 million in mortgage volume. She regularly writes about and appears as an on-air expert and speaker on the topic of consumer credit. Ready to clean up your credit, but don't know where to start? Get the Books to improve your credit scores, starting NOW. Ask about group and corporate discounts for companies, teams, conferences, credit seminars, classrooms, and professionals. Contact us today at info@tccbonline.com!